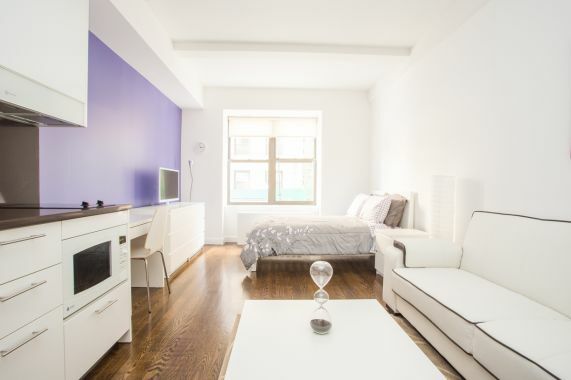 Luxury Studio Furnished: * SOFA BED * Prime location * GYM * Rooftop * Pool Party Room * Doorman * Abigael&rsquo;s Concierge * Near 1-2-3 train, 15 minute from Columbia University. * Dishwasher Modern interiors and design Boutique Hotel Services 9 to 11 Foot Ceilings 24 Hour Doorman On-Site Valet Services including Dry Cleaning, Laundry, and Housekeeping Landscaped Sundeck State of the Art Fitness Center Lounge with Projector, WiFi, and Billiards Bike Storage Room. Entertainment, dining and work are all within easy reach. Convenient to Central Park, Riverside Park, Columbia University and other Upper West Side institutions. Easy access to transportation.